I just thought I'd send you a quick email to let you know that both my umbrella and chairs arrived today - super fast delivery! The chairs and umbrella look fantastic and I can't wait to try them out! Our Beachbum chairs are better than the photos on the web - very comfy - many thanks- Prue- Dee Why NSW Sept 2011. Many thanks our beach chairs arrived today and quality is excellent - Many thanks Suzanne - Mackay, Qld August 2011. 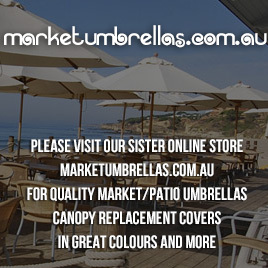 Our Carnivale 230cm beach umbrella has arrived - it is huge - great value - Tom - Mona Vale - NSW - August 2011. Thank you our umbrella received - finally a beach umbrella that can shade the whole family - Eric - Castle Hill NSW- August 2011.